Joni Ernst on last year’s ride. 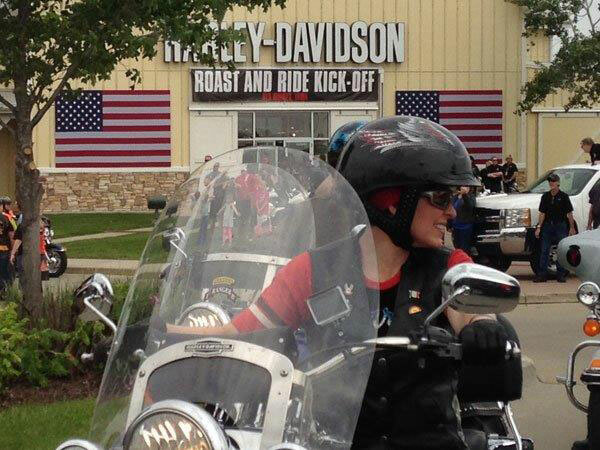 Iowa Senator Joni Ernst will hold her second annual “Roast and Ride” fundraiser at the Iowa State Fairgrounds on August 27. Ernst held the first edition of this event last June at the Central Iowa Expo site near Boone. Seven Republican presidential candidates addressed the crowd. 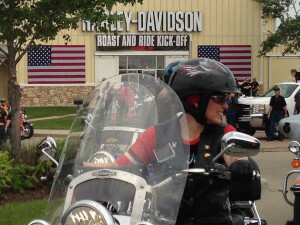 Ernst and Wisconsin Governor Scott Walker each rode Harleys and led a procession of motorcyles to Boone. This year’s edition will feature another motorcycle ride. Ernst will speak. Her staff says the event will give Iowans “an opportunity to rally in support of the Republican presidential nominee” and hear from Iowa Republicans who are on the 2016 General Election ballot. Last year Ernst said she wanted to start a “new tradition” for Iowa Republicans like the high-profile “steak fry” fundraisers former Iowa Senator Tom Harkin held for Iowa Democrats for four decades. Bill Clinton, Al Gore and Barack Obama all made more than one appearanace at the annual Harkin Steak Fry. Ernst’s staff says “additional details” about the 2016 “Roast and Ride” will be released later. Photo courtesy of Joni Ernst’s office.